While he's in Salt Lake City, the president is expected to announce he's shrinking two national monuments. President Donald Trump is on his way to Utah. 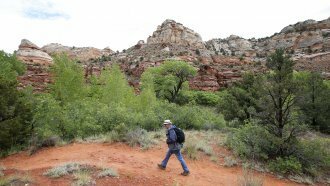 While in Salt Lake City on Monday, Trump is expected to announce he's shrinking the Bears Ears and Grand Staircase-Escalante national monuments. Both are in Utah. Back in April, Trump asked Interior Secretary Ryan Zinke to review roughly two dozen national monuments created by Bill Clinton, George W. Bush or Barack Obama. Obama designated Bears Ears before he left office, while Clinton designated Grand Staircase-Escalante in 1996. The Trump administration can resize an existing national monument thanks to a provision in The Antiquities Act of 1906. Previous presidents have reduced the size of national monuments more than a dozen times.